HONG KONG - The Peleliu Amphibious Ready Group (ARG) and 15th Marine Expeditionary Unit arrived in Hong Kong April 15 for a port visit. While in port, the amphibious assault ship USS Peleliu (LHA 5) will hold a reception aboard the ship, hosted by Rear Adm. Jeffrey Harley, commander, Amphibious Force 7th Fleet, forward-deployed to Okinawa, Japan. The visit is expected to highlight U.S. 7th Fleet forward presence commitment to promoting peace, stability and cooperation in the region. "This is a port visit that many of our Sailors and Marines have looked forward to for quite some time," said Capt. Shawn Lobree, commander, Amphibious Squadron Three. "We welcome the incredible opportunity for leisure and cultural exchange in the city." While in port, the squadron also expects to host tours aboard Peleliu for community leaders and residents. Sailors and Marines from all three ships will participate in community service projects, including landscaping and working with primary school students. Plans of scrimmages between local sports teams and U.S. personnel are also in the works. 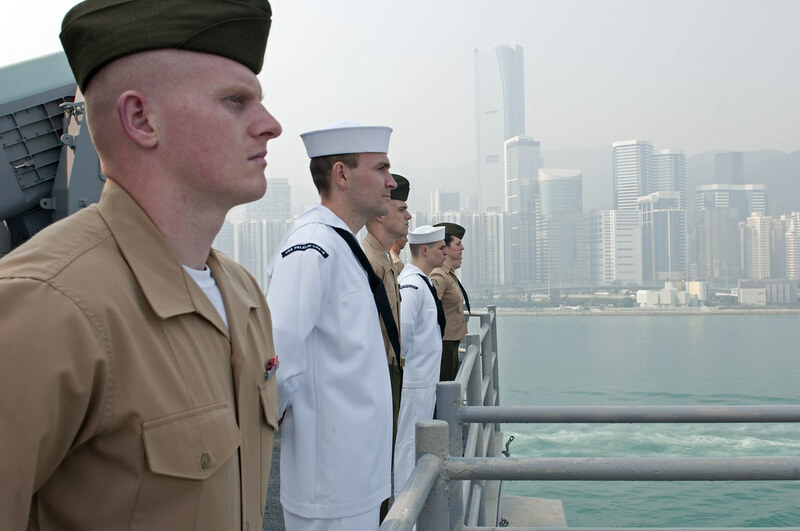 "Hong Kong is a favorite port call and we look forward to enjoying a friendly visit that affords our Marines and Sailors the opportunity to experience the city's culture and heritage," said Col. Scott Campbell, commanding officer, 15th MEU. "We appreciate the interest, opportunities and events offered by the citizens of Hong Kong." In addition to Peleliu, the San Diego, Calif.-based group consists of amphibious transport dock ship USS Green Bay (LPD 20), amphibious dock landing ship USS Rushmore (LSD 47), and embarked 15th MEU. The group just finished five-months of operational support to U.S. 5th Fleet. The ARG's port visits represent an important opportunity to promote peace and stability in the Asia-Pacific region, demonstrate commitment to regional partners and foster growing relationships.